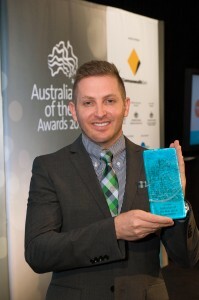 Advocacy | John Caldwell – Chairman, Entertainment Reporter, Australian of the Year in Victoria 2014, Author, Film and TV producer. Read John Caldwell’s blog, see photos and keep up to date on the latest news. Official John Caldwell site. John is an independent youth advocate and an Ambassador for Alannah and Madeline Foundation. He campaigns to spread the anti-bullying, health and well-being message on a global scale. He is actively involved with communities on all levels, from schools to universities doing research into the epidemic as well as groups lobbying to government. Making impact internationally, John is taking the message to all corners of the globe, being relied on as the link with overseas charities such as The Trevor Project in the USA and the Anti-Bullying Alliance in the UK. John's passion and commitment to the cause has created a large network of people working together to stop bullying and promote health and well being. John released a book, Full Throttle (www.fullthrottlebook.com), in early 2013 revealing his upbringing and the emotions he experienced in order to spread the anti-bullying message. John is an independent anti-bullying advocate that campaigns to spread the anti-bullying message on a global scale. He is actively involved with communities on all levels, from schools to universities doing research into the epidemic as well as groups lobbying to government. John says “I feel truly humbled to be a voice for The Alannah and Madeline Foundation, advocating for everyone in the community to take a stand against bullying. A life free from violence is every child's right and I am so proud to support such a worthy cause." Better Buddies - reducing the incidence of bullying by creating friendly and caring primary school environments. The program will engage more than 135,000 primary school children this year. eSmart Schools - addressing online safety and cyberbullying by guiding schools to develop a culture where everyone uses technology in a smart, safe and responsible way. John's book 'Full Throttle' details some horrible childhood moments of domestic violence that women and children should never have to experience. It is for this reason that John became such a strong supporter of White Ribbon Australia. White Ribbon is Australia's only male led campaign to end men's violence against women. Working through primary prevention initiatives involving awareness raising and education, programs with youth, schools, workplaces and across the broader community. As a White Ribbon ambassador, John often visits schools, universities, sporting clubs and community groups to raise awareness and encourage men to be active in the prevention of domestic violence.